With the Product Kits app, you can create bundles with multiple selective variants. You can easily create bundles with option selection. If you create a bundle with option selection, you can create variants like size, color. Important Note – There is a limit of max. 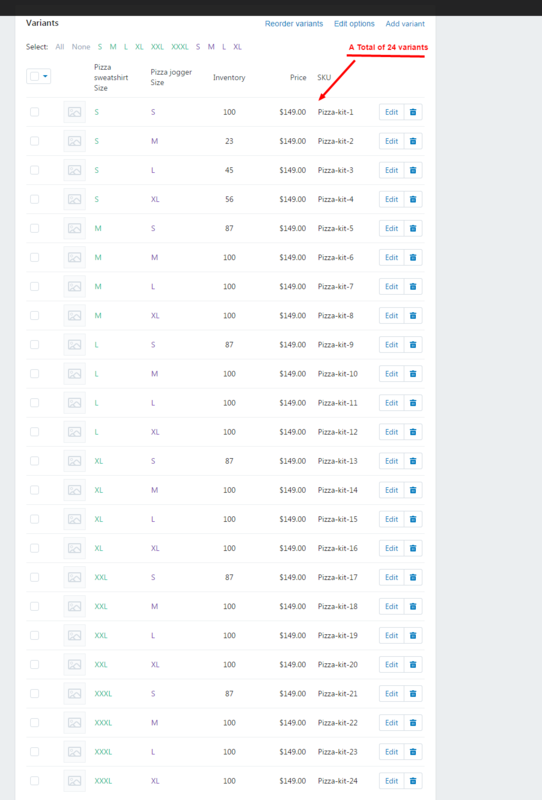 3 options and 100 variants at a time (it’s Shopify’s limit). So you can’t create more than 100 variants in one bundle. Here is a Shirt and Joggers bundle which is created using option selection. The customer can select the sizes for Shirt and the Jogger. Available in 4 sizes. S, M, L, XL. Check out the product here. Here is how you can create such bundle. I also recommend to first check out how to create a simple bundle here. First, create the bundle product in Shopify. In this particular case, the bundle product has a total of 24 variants (6 Size Options for Shirt and 4 size options for Joggers). Create the bundle product just like you create any other product. Refer to this screenshot. Please note that you need to set “Shopify tracks inventory” for all variants in the inventory section of the product. Enter any arbitrary value in variant inventory. The actual inventory value depends on the child product and it will be calculated and automatically updated by the app. Each variant can have its own pricing. Please take note that price must be set by the store owner. The app does not calculate the bundle price dynamically. Now you need to connect all the bundle variants with corresponding child product variants. For example, Bundle Product Variant ( Shirt Size M / Jogger Size L) will be connected with Shirt (M) and Joggers (L). Here is a screenshot explaining the same. Once you create 24 connections in the app, the app will automatically calculate the inventory for every bundle variant and will update automatically in Shopify. The inventory will also be automatically updated after every transaction. That’s it, you now have a bundle product which lets the customer select the sizes of child products. The inventory is tracked automatically after every purchase. Since a bundle is a Shopify product, it can support a maximum of 3 options. So you may add a color selection option in the above bundle. 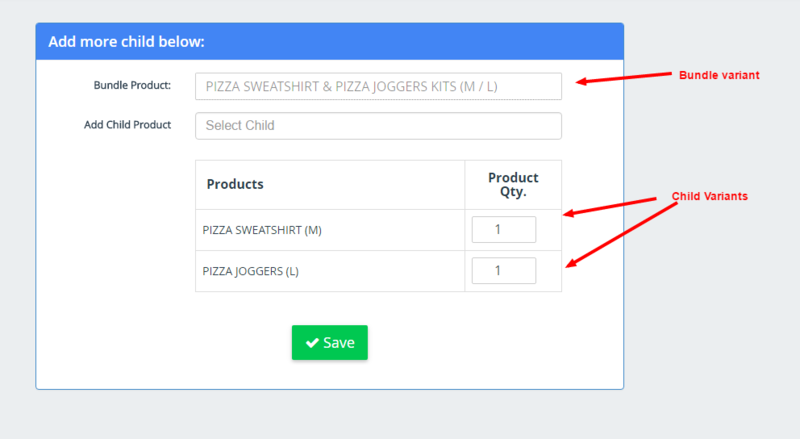 However, you cannot add color selection for both Shirt and the Jogger as it would result in 4 selectable options. If a particular variant of a child runs out of stock, the app will mark corresponding bundle variant as out of stock. So for example, if you run out of Small size Shirt, then a customer will not be able to select small size shirt in the bundle.